﻿ Philippians 1:11 having been filled with the fruit of righteousness which comes through Jesus Christ, to the glory and praise of God. having been filled with the fruit of righteousness that comes through Jesus the Messiah so that God will be glorified and praised. 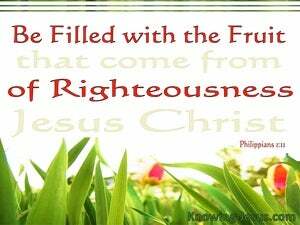 having been filled with fruits of righteousness, through Jesus Christ, for glory and praise of God. being filled with the fruits of righteousness, which are through Jesus Christ, unto the glory and praise of God. May you abound in and be filled with the fruits of righteousness (of right standing with God and right doing) which come through Jesus Christ (the Anointed One), to the honor and praise of God [ that His glory may be both manifested and recognized]. having been full of qualities of righteousness, which come from Jesus Christ and produce honor and praise to God. being filled with the fruit of righteousness, which fruit is by Jesus Christ, to the glory and praise of God. Being full of the fruits of righteousness, which are through Jesus Christ, to the glory and praise of God. abounding in good works by Jesus Christ, to the glory and praise of God. being complete as regards the fruit of righteousness, which is by Jesus Christ, to God's glory and praise. being filled with the fruit of righteousness, through Jesus Christ, unto the glory and praise of God. with your lives filled with the fruits which uprightness produces through Jesus Christ, to the honor and praise of God. Being filled with the fruits of righteousness, which are through Christ Jesus, to the glory and praise of God. 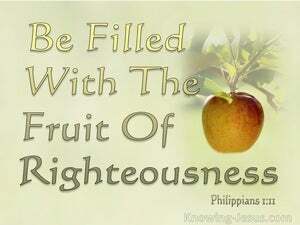 being filled with fruits of righteousness, which are by Jesus Christ, unto the glory and praise of God. Filled with the fruits of justice, by Jesus Christ, to the glory and praise of God. 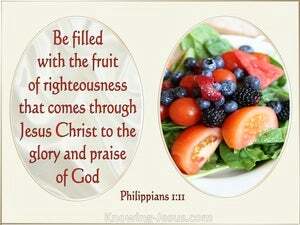 having been filled [with the] fruit of righteousness which [comes] through Jesus Christ to the glory and praise of God. being filled with the fruits of righteousness through Jesus Christ, to the glory and praise of God. filled with the fruits of righteousness, which fruits come by Jesus Christ unto the glory and laud of God. your life covered with that harvest of righteousness which Jesus Christ produces to the glory and the praise of God. being filled with the fruit of righteousness through Jesus Christ to the glory and praise of God. being filled with the fruit of righteousness, which are through Jesus Christ, to the glory and praise of God. being filled with the fruit of righteousness which is through Jesus Christ, to the glory and praise of God. filled with the fruit of righteousness, through Jesus Christ, to the glory and praise of God. Filled with that fruit of righteousness which is through Jesus Christ unto the glory and praise of God. filled with fruits of righteousness, which by Jesus Christ are to the glory and praise of God. Bearing a rich harvest of that righteousness which comes through Jesus Christ, to the glory and praise of God. 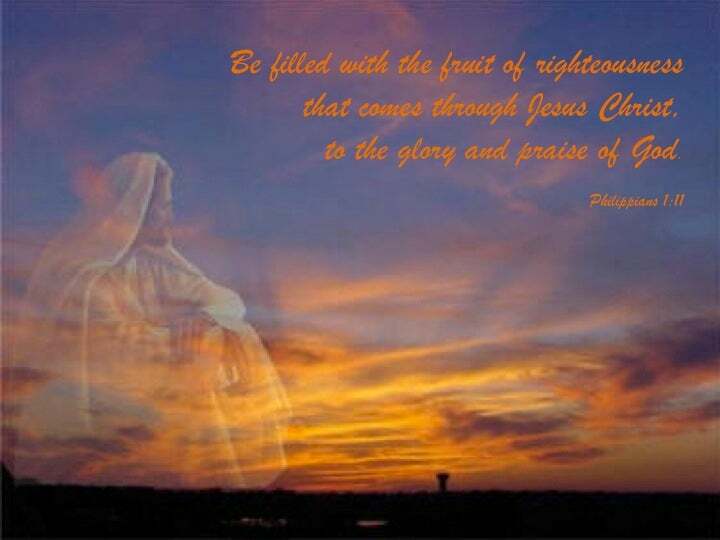 Being filled with the fruits of righteousness, which are by Jesus Christ, to the glory and praise of God. being filled with these fruits of righteousness which come through Jesus Christ-- to the glory and praise of God. men that are abounding in the fruits of right-doing with the help of Jesus Christ, to the honor and praise of God. being filled with the fruit of righteousness, which is through Jesus Christ, to the glory and praise of God. being full of the fruits of righteousness which are through Jesus Christ unto the glory and praise of God. being filled with the fruit of righteousness, that is through Jesus Christ, to the glory and praise of God.